As you may already know, FIN 4.0 has introduced several easy-to-use wizards that basically build 90% of your graphics for you automatically based on a few questions. So what happens when you have to go back and add a few points to an equip or a floorplan that already exists? Worry not! We've got you covered. This week's article goes over how to add points into a pre-existing graphic utilizing a very helpful tool called the Add Points tool. The Add Points tool can be found in the Graphics Builder edit menu. Like most things in FIN Stack, it's context sensitive, meaning the type of wizard that appears when you fire up the "Add Points" tool is always going to be determined by your context. If you're working on an equipment graphic (and your context is an equip) then the add points will bring up the standard wizard asking you how you would like to set up the bindings of each point that gets added. You can choose between Relative by Tags, Relative by navName or Absolute by Point IDs. After selecting your binding method, it allows you to select which points you would like to add to the graphic. Once you select your points, they are automatically be added into your virtual points menu. If you're working on a floorplan graphic (and your context is a floor) then the wizard that appears will be the same wizard you get when creating a new floorplan graphic. It will ask you to select a sample equip, and then allow for you to select a main point and a comparison point. Once you select the points, the window will ask you to select which equipment you'd like to bring in to the floorplan. Once your done, the points will automatically be added into the virtual points menu, and your comparison points will automatically grab the delta like the rest of the floorplan. Easy to Use / Automatic Binding: Adding points into a graphic has never been easier. Not only does it bring in the points you need, but it also automatically sets up the binding to whatever you want it to be (relative or absolute) so it matches the rest of the points in the graphic. 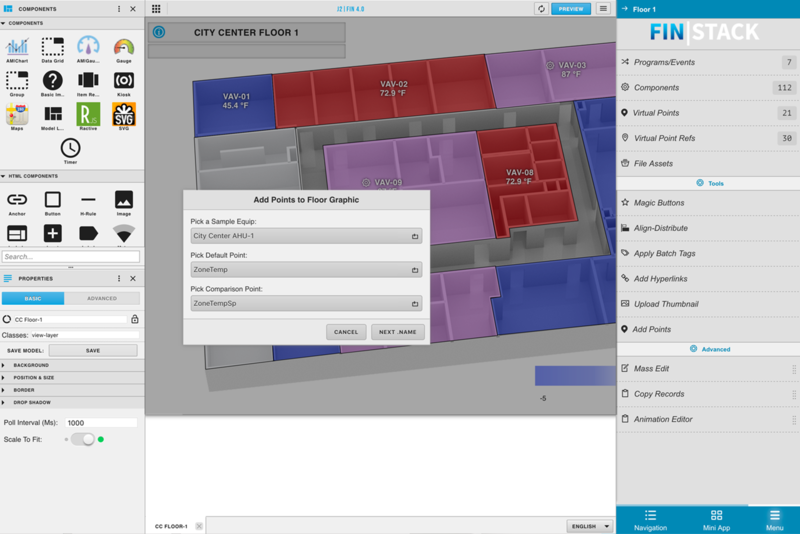 Automatic Floorplan Logic: Floorplan graphics built using the floorplan wizards contain special logic that enable the graphic to automatically grab the delta between your main points & your comparison points which then determines the gradient colors that appear on the floorplan. 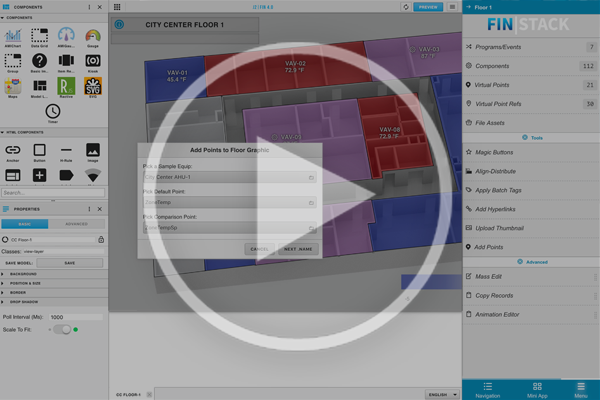 The Add Points tool automatically adds the necessary tags to the comparison points so that it works seamlessly with the rest of the logic on the floorplan.